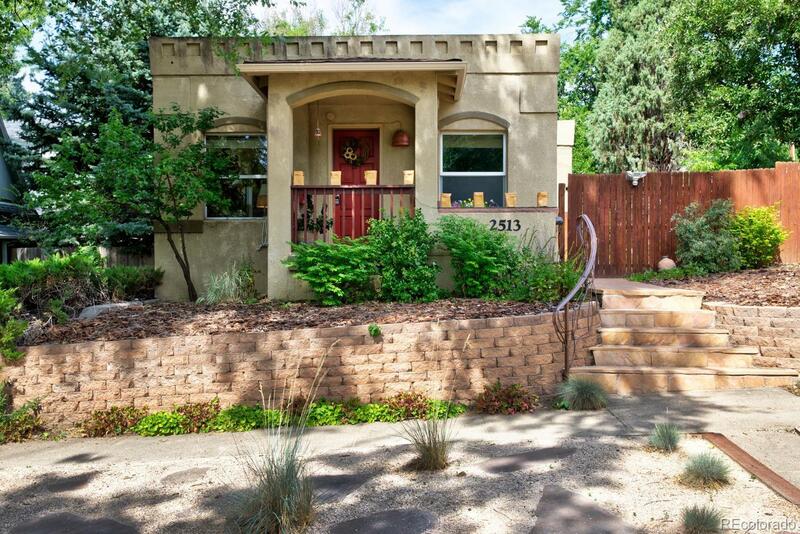 Nestled in the much sought-after Sloan's Lake neighborhood is this beautiful well maintained 1900 rare Adobe home, just a stone's throw from the lake. Close to Highlands, Tennyson St., Saint Anthonyâs redevelopment, Lo Hi, Edgewater, and minutes from downtown, highways and light rail... The home features low maintenance yards, 2 bed/1 Bath and new renovated bathroom w/over-sized shower and beautiful Green Onyx tiles & handicap accessible door. The sunny living rooms faces east w/southern exposure, making the space bright throughout the day and all 4 seasons. Home has hardwood floors, large eat-in-kitchen w/solid maple cabinets. Picture perfect back yard (lot size 6,370) new 2 car garage, artificial turf (low cost) & multiple destinations! Relax on covered deck, dine on the patio under the trees, play in the side yard, work in the stand-alone office/studio (fully finished), or sit by the fire pit. Furnace & A/C serviced and cleaned, furnace certified, new EPDM (high-end) roof 2017.